The introduction of the Beaujolais Nouveau has become a tradition in France and all over the world- a festival of live music, French Food, and ‘new on the market’ wine, for all to relish. Here, in New Orleans, it has become the French American Chamber of Commerce’s main entertainment event, which benefits our year round activities- namely, supporting its lifelong mission to promote French investment in Louisiana and increase trade between Louisiana and France. Sample wines from the famous Beaujolais region of France along with tempting treats from the kitchens of some of New Orleans most talented chefs. Enjoy live music. Bid on a host of great items in our auction. Tickets include food, wine and entertainment for just $60. Friends of Uptown Messenger receive a 10% discount. 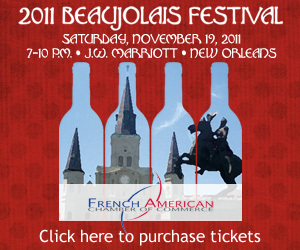 Visit http://2011beaujolaisfestival.eventbrite.com/ to purchase ‘Friends of the Chamber’ tickets or for more information. This year an After Party will follow the main festival. This late-night soirée is specially designed for young professionals (and the young-at-heart), and will feature popular French hits by DJ Otto. Admission is $10. I went the French Chamber’s summer wine event and it was great. A lot of food, a lot of wine for little money – I think it was about $50 and I ate/drank all night, as did my husband. It’s a fun night out and much cheaper than going to a fancy restaurant and eating and drinking all night. We plan on going to this event, too. Don’t think we will make it to the after-party, though. That’s wonderful about the 2011 Beaujolais Festival! It is a great event held by the French-American Chamber of Commerce. It’s terrific how friends of Uptown Messenger receive a 10% discount off tickets!